Trigger images from PrimaryArms.com, which sells all the triggers reviewed here: Geissele, Elftmann, Timney, and ALG Defense. Are you thinking of upgrading the trigger system for your AR-platform rifle? There are dozens of options available, from $45 up to $300. Thankfully, Brownells has created video reviews of some of the more popular AR trigger options from Timney, Geissele, and ALG Defense. And we included a video review of the highly-regarded Elftmann Match Trigger. If you want the best solution for Service Rifle competition, you might favor the Geisselle. For ease of installation, it’s hard to beat the Timney, a “drop-in” module. Like the Timney, the super-smooth Elftman is a drop-in module. At $249.00 it’s pricey, but it is one of the best AR triggers out there. If you’re on a tight budget, the best “bang for your buck” may be the “Perfected Mil-Spec” ALG which starts at around $45.00. According to Thomas Conroy, ALG triggers “are the perfected version of the standard, non-adjustable mil-spec original trigger. They have the same geometry, but are made to higher quality standards, and come with … hardened and smoothed-out sear contact surface to eliminate all grittiness.” These are also offered in a nickle-boron coated version. Available for under $45.00, the ALG is a well-made, low-cost option for shooters who want a better factory-type trigger system. Learn more about Geissele, Timney and ALG triggers, plus two more AR trigger options (CMMG and Rock River Arms) in a Trigger Comparison Review by Thomas Conroy on Ammoland.com. 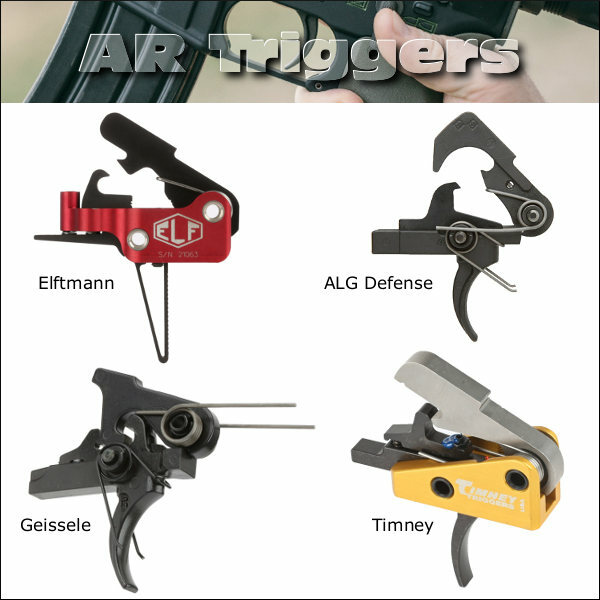 Share the post "AR-Platform Triggers: Geissele, Elftmann, Timney, & ALG Defense"